Puzzle HD requires the installation of the ZZSCPuzzleHD-Regular truetype font (included). Simply open Font Book and drag the font into the font list column. If Final Cut is running, you will need to restart it so that it updates its font list. 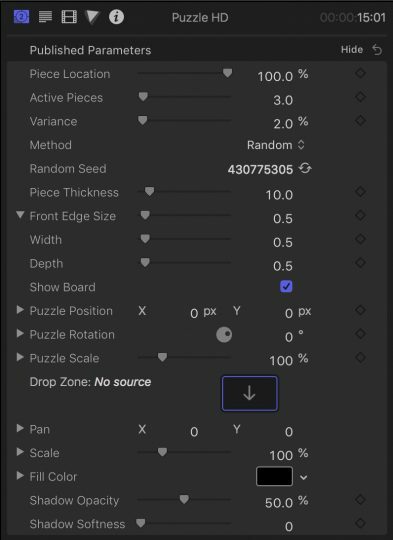 Puzzle HD does not animate on its own but only needs one parameter keyframed to animate the effect to your liking. This method allows for “freeze frame” animation for effect. The puzzle can be resized, moved and rotated in space. It’s very easy to use. An optional puzzle board background (wooden texture) is provided. The yellow/orange diamond demonstrates an active keyframe. It only appears yellow when the playhead is resting on the frame on which the keyframe is set. Below the yellow/orange diamond is an unset keyframe (default). When you mouse over an unset keyframe, FCPX shows a tooltip to “Add a keyframe”. The curved arrow on the right side is a “reset” button (which will clear all keyframes and reset the parameter to its default setting). Not shown are left and right facing arrows that appear when the playhead is on either side of a set keyframe which can be used as a shortcut to set the playhead on the next or previous set keyframe. You can have a keyframe set on each frame (possible but not practical). FCPX will interpolate parameter values when the playhead is between two set keyframes. 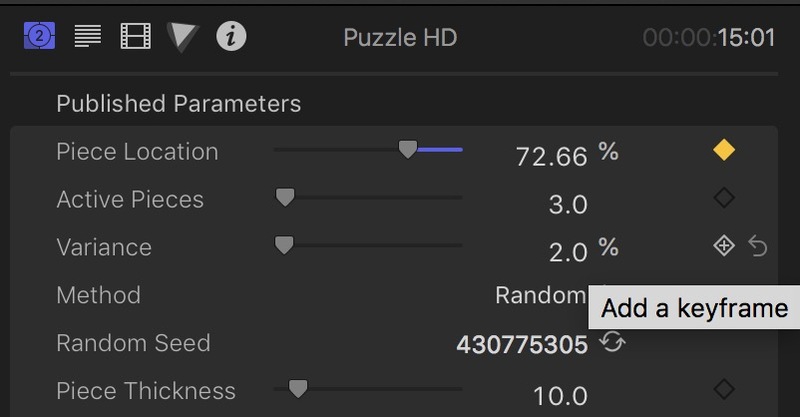 Puzzle HD is animated by the Piece Location parameter. The default is set to 100% (fully assembled). The 0% value is a completely disassembled puzzle and more often than not, all the pieces will be off-screen. To see how this works, go down to the Puzzle Rotation parameter and dial open the disclosure triangle on the left edge of the parameter. Change the Y parameter to 45º. Adjust the Puzzle Scale down to 80%. Adjust the Active Pieces parameter to 10 or so. Slowly drag the Piece Location parameter from 100% down to 0% and watch the effect. Move Piece Location back and forth a few times. That’s the effect. You set the timing, you set how far puzzle pieces are placed (with or without animation!) Everything else is customization. This parameter determines how many pieces will become animated with respect to the setting of Piece Location. A setting of 0 will move only one piece at a time from its beginning location to its end location, then move the next piece until its completion. The higher the value, the more pieces will be moving at the same time (but still like a “race” to the finish, you will still see a starting order). The slider goes to 100 (there are only 35 pieces of the puzzle), but you can click on the number value and drag it up to higher values which will compress the travel distances over all the puzzle pieces the higher the value. This parameter introduces more random motion but not in position, but XYZ rotations. Cranking this value up will get the individual pieces spinning around like “crazy”! There are three animation methods: 1) Random (this is the default — pieces animate in random order); 2) By Single Column — this will cause the pieces to animate by “column” (left to right going from 0% to 100%); 3) From Ends to Center — this will guarantee that the last piece to “fit” will be the center piece (or conversely, the center piece will be the first to move out). This is changed by clicking on the circular opposing arrows will generate a new random value. This value affects Variance only. This parameter determines the thickness of all the puzzle pieces. This puzzle is created in real 3D and the back sides are textured as cardboard. The default value of 10 works best in general, but you can decide for yourself how you want pieces to appear. Since the puzzle does not require animating, the freeze frame appearance may need a different look. Another 3D look option. There is a disclosure triangle, however, this parameter may already be open by default. The actual parameters that mater are Width and Depth. When Width is 0, you should have a seamless image. Keyframing this value from any positive value down to zero will transition the appearance from puzzle to normal video(/image). The Depth is the vertical (in 3D, this direction is towards the viewer) distance of thickness of the “edge”. These values are completely separate from the Piece Thickness value. This generator has an optional wooden puzzle board. This parameter is set on by default. You may uncheck the parameter to hide the puzzle board. The location of the puzzle in the viewer. Dialing open the disclosure triangle reveals a Z position parameter which matters (and is different than scale although it can be used in much the same manner!) The XYZ parameters can be keyframed to animate the puzzle in your scene. These parameters, like Position, may be keyframed to animate the rotational orientation of the entire puzzle. This parameter is a useful shortcut to resizing the appearance of the puzzle in lieu of manipulating the usually hidden Z position parameter. This is filled, by default, with a custom drop zone (which forces the aspect ratio of the media dropped to 16:9). This is a standard Final Cut Pro drop zone otherwise. If correction is needed the following Pan and Scale parameters can be used to make adjustments and/or corrections. Fill Color is used for a background in case of any media with an alpha channel (transparency). Puzzles don’t usually come with holes in them!